Launching ProTasker was simple. Because it’s web based, there was no download of a product. I signed up for a free trial, and it’s necessary to input your payment information even though you won’t be charged for 60 days. During the sign-up process you’ll be asked to enter a subdomain name, so think ahead of time what you want to choose. ProTasker immediately put me into the introductory portal, but I logged off the Internet (as I always do whenever I’ve just entered payment information). When I signed back on, it took me a few minutes to realize that there was no login page for ProTasker. Once I entered my subdomain name in my Internet search bar, I was in. have any projects and I wasn’t quite certain what to do. Then I noticed a little yellow megaphone that says “Help”—so I clicked on it, and a video opened to show me how to get started. Ta da! The big question I had after I watched the video was a rephrasing of that age-old dilemma—what came first, the chicken or the egg? In this case, my problem was what came first, the project, the contacts, or the tasks? I entered the name of my first project—Accreditation Site Visit. (Yes, if you’ve checked out my MS Project tutorials, you’ll be familiar with it.) But I could not enter a client contact, and I could not choose a category or a project tag. The only employee name in the drop-down list was mine. Once again, I clicked on the yellow megaphone, and I was directed to click Edit Settings at the top of the screen. From there you move to an overview screen with a list of categories on the left-hand side. several. You can click on the name of the sample client, and off to the right you’ll see a screwdriver and wrench logo—that’s how you edit client information. You’ll see that logo throughout the product. Project Categories. Selecting this heading opened the Project Category screen, where Sample was the only available category. I was able to choose “add new” and created both Short-Term and Recurring categories as potential categories for my projects. You can change the name of a category by clicking on it and typing in a new tag. Project Tags. 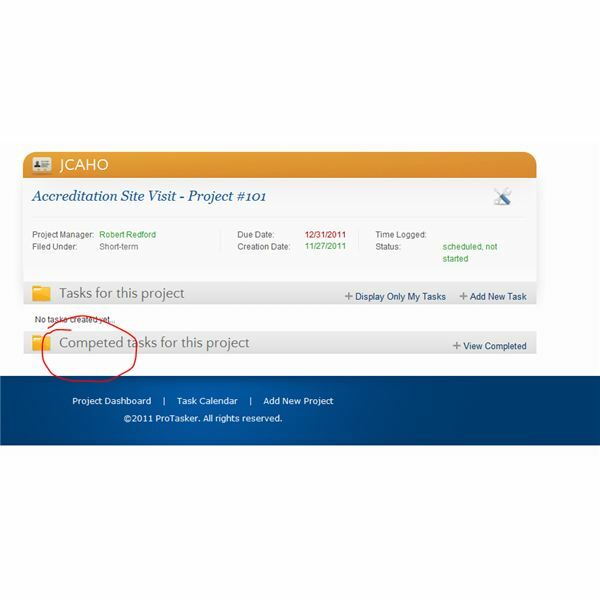 Creating project tags that you can attach to various projects will come in handy later as unique task identifiers. I renamed the sample in the project tag screen, and then I added several pertinent to the function of a healthcare facility. Project Status Definitions. Initially, your choices are Complete, In Progress, and On Hold. I added a fourth category for Scheduled, Not Started. I then chose that as my default project status, so that any project I begin will show as scheduled, not started. Task Status Definitions. The preset definitions were Complete and In Progress, so I added Pending. 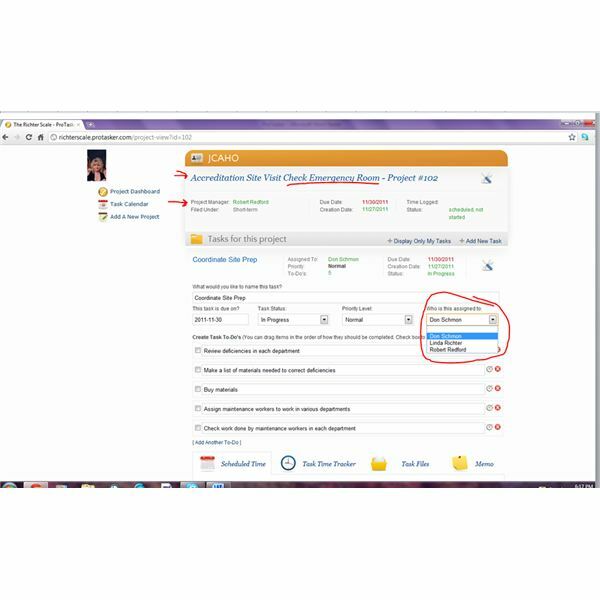 You will notice in the image that you can choose Selectable by Project Manager, Notify PM When Status Is Changed to This Value, or Assign Task to PM When Status Is Changed to This Value. Task Priority Levels. On this screen, you can choose from High, Low, Medium, and Rush. You can reset the color coding by clicking on the color and activating a color palette that lets you select any shade you like. I didn’t add anything to this. 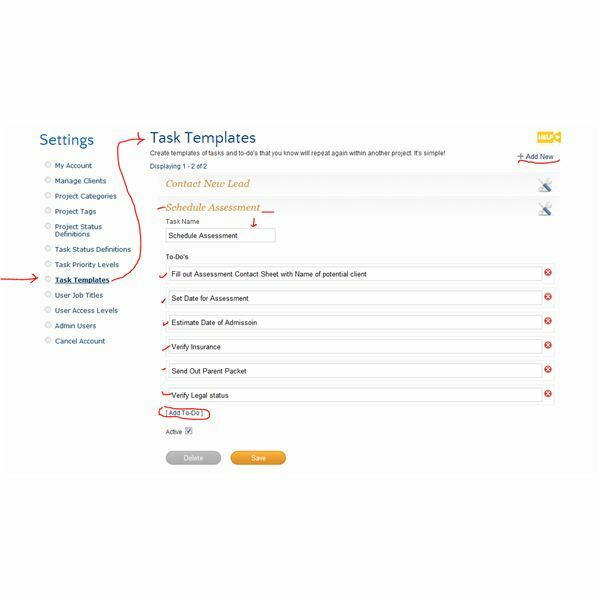 be taken every time a new lead is assigned for the sample task Contact New Lead. Then I added my own template, which is simply a list of tasks that must be completed each time a specific task occurs. For example, if someone is scheduling a patient to be assessed for possible drug rehabilitation treatment, the steps would be taken as shown in the image. Later on, when I was assigning a task concerning the evaluation of a department for the Accreditation Site Visit, I had the option to make the “to do” list into a template, which I did. User Job Titles. This category, like some of them, is difficult to complete if you don’t know exactly who will be working on a project. However, since you must have user titles already entered before you can specify them in project tasks, I came up with several job titles for people who might be relevant to the project tasks I will be entering. You must enter duties for each job title. This is the kind of thing that was annoying initially, but as you get rolling with ProTasker, you will reach a point when everything you need, really, is entered. User Access Levels. At this screen you can set the level of responsibility that accrues to various members of your staff. Set parameters here, and when you add staff you will indicate if they are Normal Users, Project Manager, or Super Admin. You can also add categories such as Mid-Level User and check off the privileges for someone at this level. Admin User. 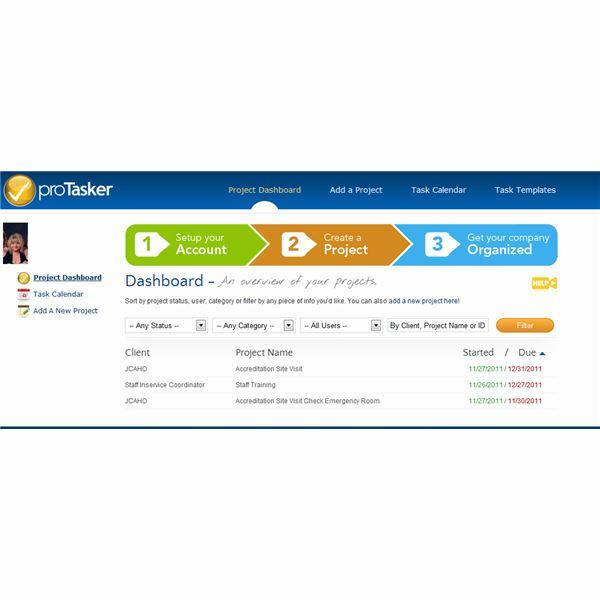 This category allows you to select the people who will use ProTasker. You can see in the image I’ve added Robert Redford, and I have designated him as a Project Manager. He also has the title of Project Manager. The box for User Task Role is another one of those chicken-or-egg things; it picks up selections from your Tasks entered. That’s the point when I went back and entered Accreditation Site Visit so that I could select that responsibility for him. Again, this will cease to be a problem once you are using ProTasker on a daily basis. 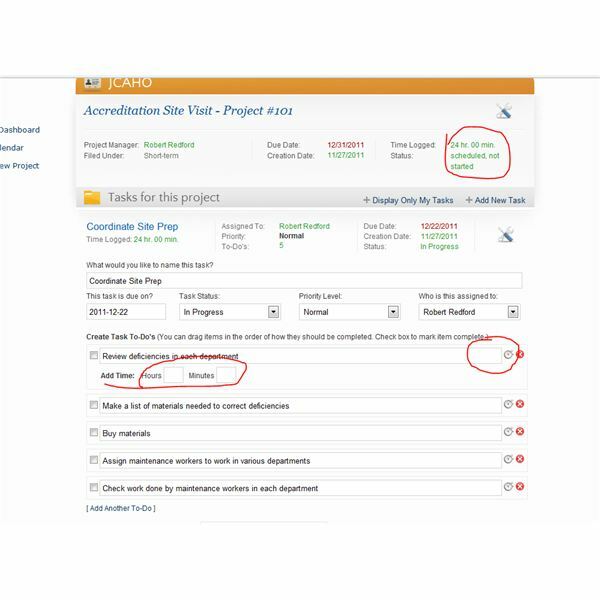 your project staff, and in parentheses besides their names you will see how many tasks are assigned to them that are not scheduled. 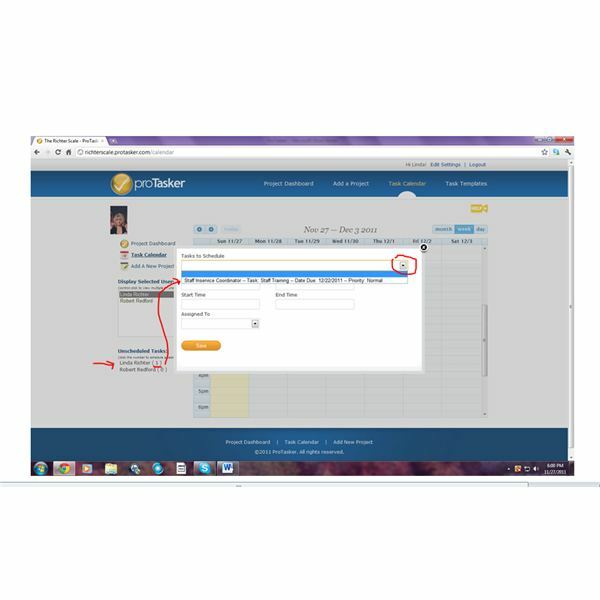 As you click on the number, a window opens so you can set dates and times for the tasks. Once that’s done, you can set the calendar to show you a day at a time, a week, or a month. It worked the way it was supposed to, but I could not edit the employee’s available time, nor could I change the time to be spent on specific dates. For example, when I set Coordinate Site Prep for JCAHO, ProTasker blocked off all of Robert Redford’s time from 10am on the first day of the task until 2pm on the last day of the task. If I wanted to show he was working on it 8 hours one day and 4 hours the next, and so forth, I would have to re-enter each day’s work as a new task. One very nice feature was the ability to track time spent on tasks. Assuming your people will click on the little clock at the end of the Task To-Do line, a window opens to enter hours and minutes worked on the task. ProTasker tallies this up in the upper right-hand corner. Initially I was frustrated by my inability to add additional people to tasks—after all, Robert Redford is not going to perform all those maintenance checks by himself! As I gave thought to how I would use it, I think a good option would be to designate mid-level users as project manages and then assign their tasks. As long as the client remains the same for each project, the real project manager’s name remains unchanged. Emergency Department. I want the maintenance chief, Don Schmon, to do this, even though he ultimately reports to Robert. But in order to designate Don as the assigned person, I had to add him as a project manager—otherwise I did not have the option to assign it to him. Once that was done, I was able to utilize the already-created task template called Coordinate Site Prep. Then I could create another project, Accreditation Site Visit Check Admissions Department, then Surgical Suite, and so forth. 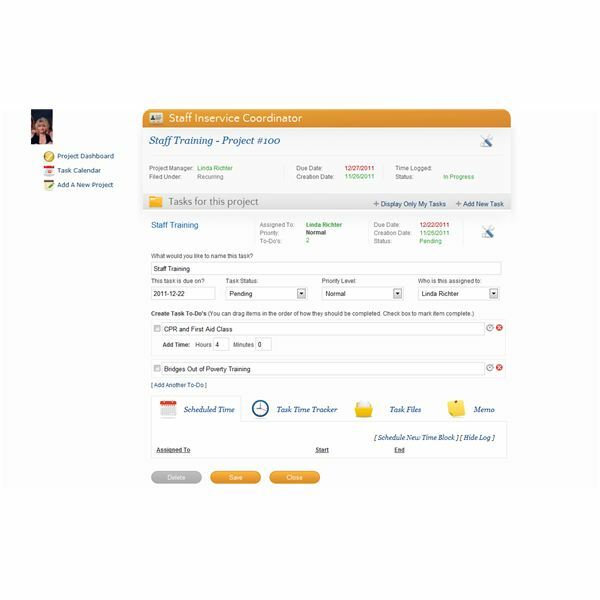 Even though these are really subtasks of a big project, this also lets you set dates for each stage of the project and assign tasks to different people. You can, of course, give your people access to the subdomain name. They can sign on and see their scheduled tasks for the day. 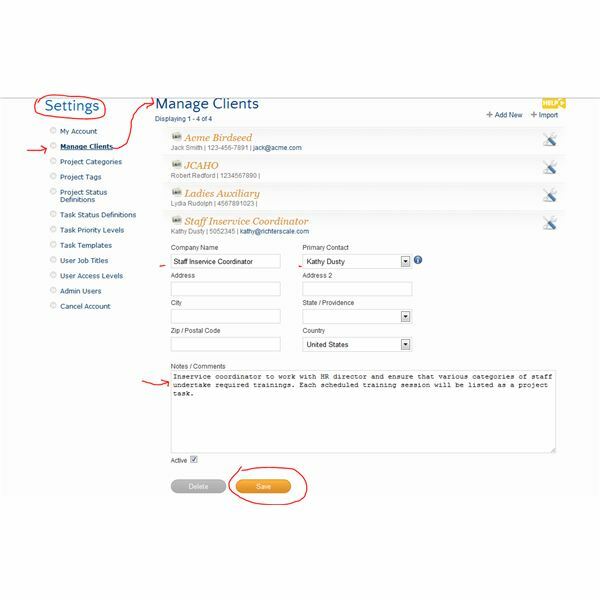 If you work off a server, you can enter your FTP information at the Account Settings screen, and even clients can access information that you specify. I did not check this out. I’m going to give this a low rating. First of all, you have to pay $47 a month for this product, and I think that’s a bit much—more on that in a minute. The ultimate reason for not giving this product a high rating is because I had some problems with it. The misspelling of the word “completed” really bothered me. In the User Level screen, when I clicked on each of the user types, there was no list of privileges to be checked off for each type. In the Task screen, according to the Adding a Task tutorial, there is supposed to be an option to upload files. There was no Choose button as specified in the tutorial. There is a button to review files you have uploaded—this could be a very useful tool, but it’s just not working for me. I tried this repeatedly, and there is no access to tech support. The lack of tech support annoys me. You can’t even send an email. The little yellow megaphones are nice, but it gets frustrating trying to double-check how you’re supposed to be doing things. A complete list of tutorials is available on the screen where you buy the product; it would be nice to have them not just on various screens also as a list somewhere within the product. I have to say that I would not recommend this product until its owner fixes some bugs and makes tech support available. SmartSheet costs only $30 per month (with a limit of 50 pages), and I had great success when I took it out for a drive. If you’re going to pay $564 per year for ProTasker, it will take you only a little more money until you can buy MS Project Professional 2010 (and the standard version is under $500). 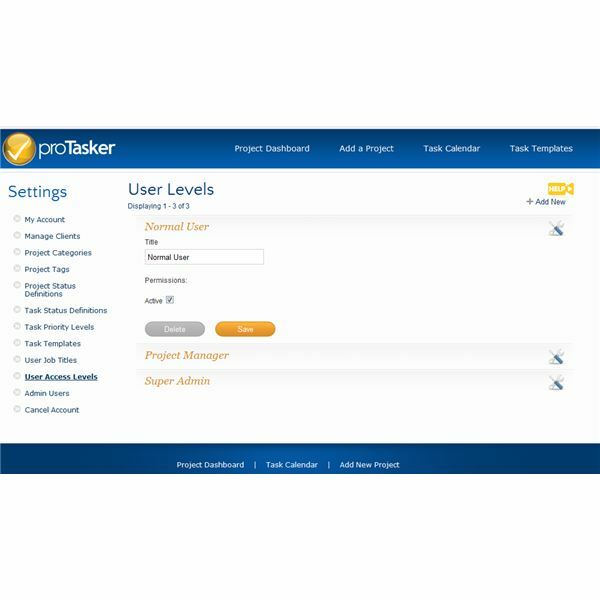 However, ProTasker is a very new product, and it has many great features. I plan on staying tuned for updated versions. Based on the writer's experience with project management products.